Well it's that time of year. Spring is not only synonymous with flowers and birds and rainbows and unicorns, but it's also when vegans all over the world join forces to participate in the Worldwide Vegan Bakesale! This book is awesome. It's full of both sweet and savory recipes designed specifically for bake sales. I was really excited about the savory recipes. (Check out the Roasted Garlic and Peppercorn Crackers on page 236!) Personally, whenever I bring savory items to a bake sale, they always sell out. Sometimes people want more than just cupcakes and cookies. But don't discount the sweet recipes in this book, because they rock! I really like the Carrot and Pineapple Scones (page 77) and the Orange Chocolate Chip Cookies (page 130). 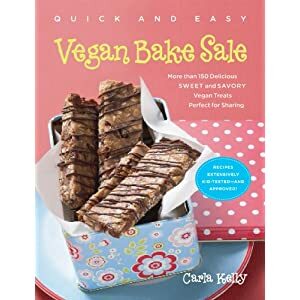 In addition to the great recipes, the book also has a great intro to baking and a chapter on holding the perfect vegan bakesale! Leave a comment telling me your favorite treat to make (or buy!) for a bakesale, and on Sunday, April 17th at 7pm (PST) I will choose a winner to receive a copy of this awesome book. Yes, I will ship internationally. Giveaway now over. Congrats to JoAnn #65!